The work of Steven Luke Walker including his concerts at St James Studio and his delightful musical adaptation of Little Women. Read feature here. Steven Luke Walker is a vocal coach, musical director and composer, and one of London’s most respected writers of new musical theatre. I have seen three evenings featuring his work: TransAtlantic, a joint production with Jonathan Reid Gealt and Craig Adams at St James Studio last year, his most recent solo concert of his works The Acoustic Night, also at St James, and now his musical adaptation of Susan May Alcott’s classic novel Little Women at the Union Theatre. Like me, Walker likes history, and much of his work reflects this interest. He has written and had staged The Lion, the Witch and the Wardrobe, developed concept albums and pieces based on The Princess Diaries and Brokeback Mountain, and on specific historical events such as the Great Fire of London. I asked what provides the spark for inspiration. 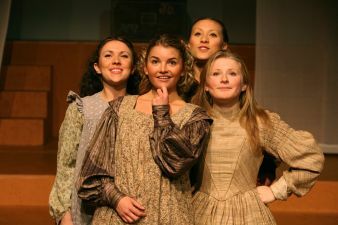 In Little Women, although the story is set in a small family in a small town in Massachusetts, the epic element is the developing individual characters of the four sisters, their growing up and interactions set against the American Civil War. Rather than focusing principally on the role of Jo, as most adaptations are, Walker has chosen to examine the sibling unit more specifically. Whilst remaining very true to the book, it extends our understanding of Jo herself by setting her against the changing aspirations and emergent adulthood of her sisters. It was great to watch a full production of one of his works and see his students at Guildford School of Acting bring it to life. There are moments of great charm, beautiful movement and choreography by Richard Jones, and a very strong cast in the family members and the male characters they meet. It is still a work in progress. There are parts that Walker wants to re-work and develop, particularly in the first half. His intention now the run at the Union St Theatre is over is to take a couple of weeks off, record the concept album of the piece, and then begin work on the new version, which will concentrate even more precisely on the four sisters, further refining their characters and relationship. Where the piece will go next is a subject of some discussion. The current producers are keen to get it on the road and play it in theatres such as the Watermill, but ultimately Walker would like to see it in slightly larger venues, and preferably more classical theatres in the West End. Something to watch! Speaking of new directions, I mentioned I had noticed when watching his Acoustic Night concert at St James a possible new development in his composing, illustrated by the song Only Power, sung by Martin Neely and written for the character Voldemort on his concept album of Harry Potter and the Philosopher’s Stone. The song sets the main vocal line on one rhythm whilst the piano accompaniment plays a different rhythm against it, creating a tension and air of menace, not only underlying the evil of the character portrayed, but pointing towards an impending doom. It struck me when listening as a more mature piece of writing. He replied saying he had not set out to write in a new way neither for the album as a whole, nor for that character. He had wanted what he always wanted for any adaptation he writes, and that is to accurately reflect the spirit of the original book or work. However, he had had a bit more time and space to write that particular song than normal in his busy teaching job at the GSA, where he is Head of Singing. The quality of the work probably reflected the time spent honing it. This begs the question as to his future direction in general, as he is a dedicated teacher of voice with strong opinions on the training of the modern musical theatre vocal instrument. Will he devote more time to his writing or to training? He doesn’t quite answer…another thing to watch! The discussion of his training work ties in with another of the questions I had prepared, which was that I wondered if there was any specific reason much of his work concentrated on American stories and themes. As well as work based on the film Brokeback Mountain highlighted in his concerts, he is about to start writing a piece about two American drag nineteenth century drag artists called Fanny and Stella who end up in jail for their performances. It is, indeed, a direct result of his understanding of the voice and how it works, and his observation of vocal training being so much more advanced in the States than here. Some of his greatest idols are American songwriters like Stephen Schwarz and Disney’s Alan Menken (Newsies, Mirror Mirror), with their strong storytelling elements combined with rich melodic values and harmonies. And although he is not a major fan of Stephen Sondheim, his scanning of lyrics and rhyme cannot go unmentioned. These examples of musicality, combined with the vocal sound, have therefore inevitably led him to write works that lend themselves to an American setting. I really hope that it will not be too long before Walker realises his dream of seeing his works created in bigger theatres with bigger production values. They would suit such venues down to the ground, and if Little Women is anything to go by, have true commercial potential. Walker originally trained as a dancer in the Royal Ballet School, and this discipline is evident in his work. He reflects and refines until it reaches the high standard he desires for it. To see it in the West End would be a success much deserved. This entry was posted in Features - Theatre and Cabaret News and tagged Acoustic Night, Stephen Luke Walker. Bookmark the permalink.